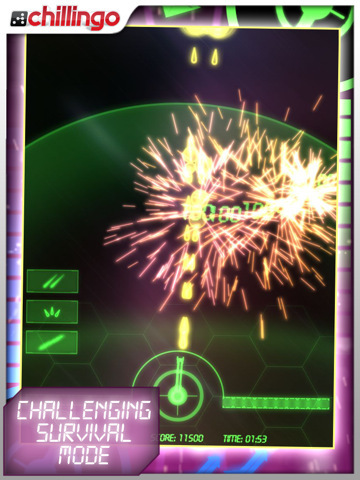 If you’re a fan of retro space shooter games, you can add Neon Battle HD to your collection of outer space destroyer apps. Developed by laXarIS and distributed by Chillingo, this retro arcade style game takes all the goodness of classic shooters and adds to it a bit of pop. This is a neon and black sensory overload, and I mean that in the best way possible. 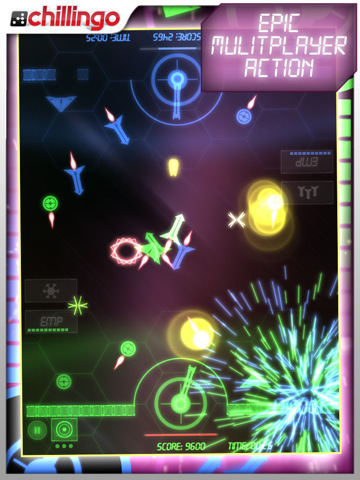 In its most fundamental form, Neon Battle HD is a universal game with modes for both single player (deathmatch, quick battle, survival) and multiplayer (deathmatch and quick battle) battles. Both modes are equally fun, but because there are so few games that offer legitimate multiplayer interaction this is particularly appealing. Whether you’re playing against the computer or a frenemy in the flesh, each side of the iPad is a neon base that must be protected at any cost. On the offensive you shoot off missiles and guns firing for the enemy, but you must also destroy flying attack forces before they crash-bomb into your base and disintegrate your defenses. While the sound effects are overwhelmingly wonderful and retro at the beginning, the techno shooter soundtrack can get a little annoying over time. Still, the graphics are an absolute delight and the sheer amount of action that takes place on the screen at any given time is really quite beautiful. To win the game you destroy the enemy troops on the opposite end of the iDevice. From there scores can be saved in either Crystal or Game Center for bragging rights. Although some of the iTunes reviews I read expressed frustration with the game crashing, Neon Battle HD never crashed while I was playing and mostly ran quite smoothly. There were some instances when the controls felt a bit delayed, but overall the experience was satisfying. 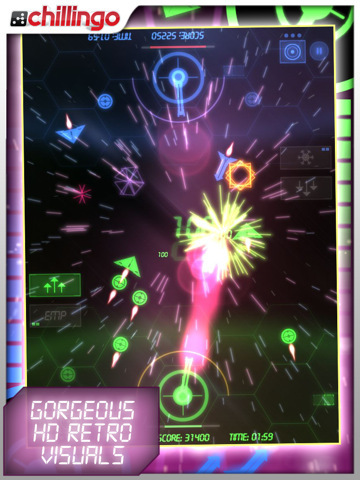 If you’re looking for the next innovative version of space games Neon Battle HD isn’t your answer, but when it comes to straightforward shooters this certainly does the trick. From the interactive tutorial to the setting that lets you watch the computer play against the computer in between your own battles, this is one fun little shooter. 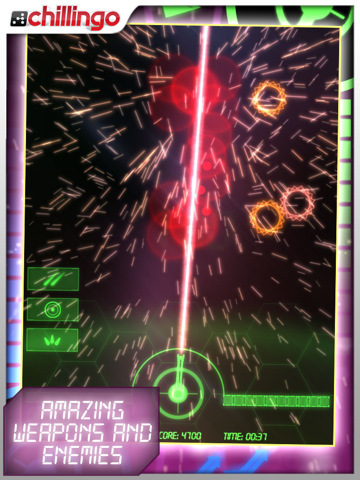 Bottom Line: Neon Battle is a fun modern remix of the classic arcade style space shooters. Don’t expect to be shocked, but you’ll certainly be satisfied.